Understanding the process of raising capital and what’s involved is the key to successful capital acquisition. Most companies think capital acquisition is an easy process that happens in a matter of days. Banks are not that interested in lending to smaller companies anymore. While you may get a lot of phone calls and emails from business lenders, most of them are just factors or real estate lenders. These firms are asset based lenders who will not lend beyond the collateral. 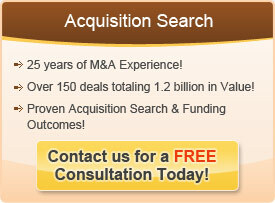 Companies that are successful at capital acquisition approach it like an important business development project. They make sure they have the proper resources, focus and timing expectations. Most capital acquisition projects take months to complete. They are highly information intensive projects. Most lenders require monthly financial statements and several years of profit & loss statements and balance sheets. This requires a high level of financial information organization. Also, the lenders being targeted may have a different way of understanding business. Most lenders are financially oriented as opposed to operationally oriented. This means that you may want to describe your business in financial ratios and metrics. The more financially oriented your company appears, the more sophisticated the lender will think it is. Finally, it is critical to have a person on your team who is an expert at dealing with lenders. An experienced financial consultant will manage each step in the process and ensure you are targeting the right lenders with the right set of materials.